Pack the perfect Disney diaper bag with Huggies Little Snugglers diapers & other essentials to keep your load light and your little ones happy all day long. Traveling with young kids is quite the adventure. When Chris and I took our little guy to Disney World last month I was so nervous about forgetting something at home while I was packing. 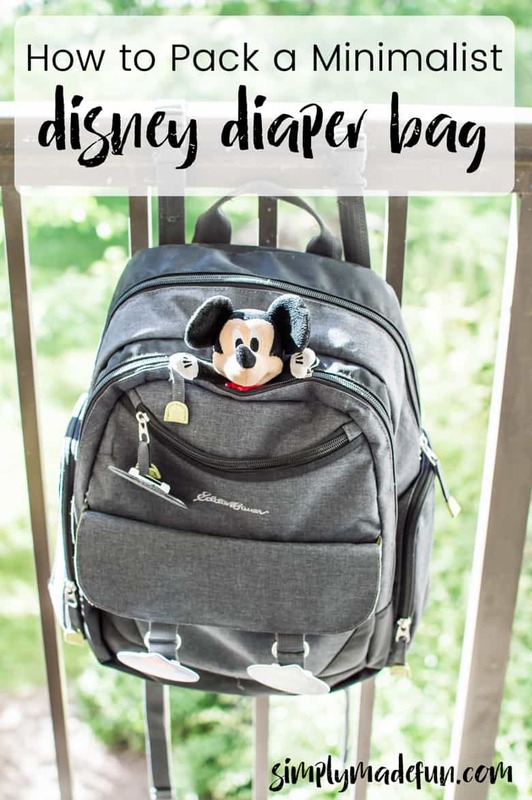 My main goal was to keep our little one happy and comfortable so that he could handle ten hours a day in the Florida sun, and I knew a huge part of that had to do with what I packed in his Disney diaper bag and what we brought into the parks. One thing I am very passionate about when it comes to carrying items inside the parks is to keep it simple and light. Bare minimum is the way to go! The reason being is because I’ve been that person who has lugged around a huge bag before and my shoulders and back were so sore that afternoon and for the rest of the trip! Let me tell you, you do that one time and you will never repeat it again. On our most recent trip I thought long and hard about everything I may need for our little one while we were at the parks. While I could’ve packed a suitcase that would accommodate a family of four I knew I had to tone it way down if my back wanted to survive the trip. One thing I’ve done when we’re going on a road trip is buy a box of Huggies Little Snugglers diapers and natural care wipes from Sam’s Club because then I know I’ll never run out while we’re away! It’s a huge relief to know that we’re covered if my little guy has any digestive issues. And even though we’ve only been on one trip to Disney so far, I think I’ve got a good idea of what we need for our little one while at the parks! And I’m sharing my secrets with you. 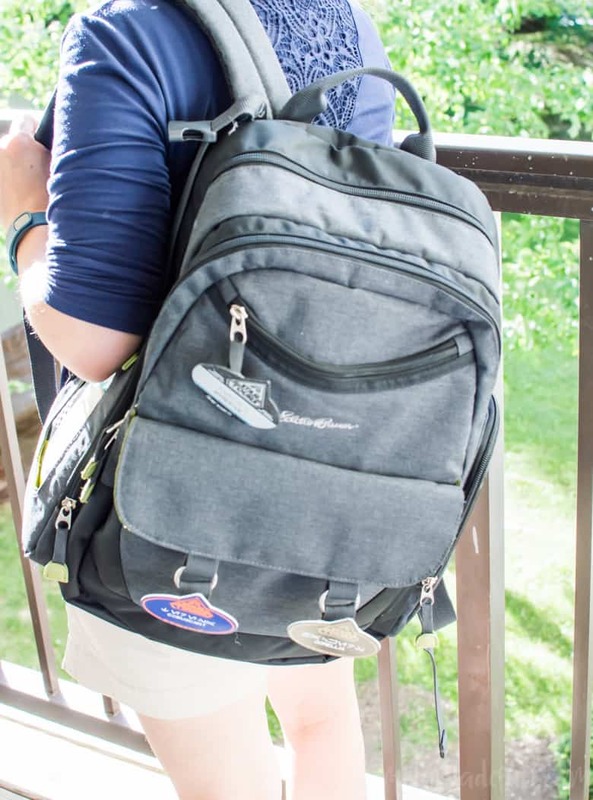 When it comes to packing the perfect diaper bag, I break it up into 4 categories to make sure I have everything I could ever need: hygiene, food, distractions, and clothes. You can add and subtract items depending on your child’s age and needs, but for the most part I’ve found that these items can be used for the long haul! Huggies Little Snugglers Diapers and Natural Care Wipes: I usually keep about 10 diapers in my Disney diaper bag at any given time, and then stash extras in our car if we need them since we drive to Disney. And of course, same goes for wipes! Diaper Cream: This is one thing I don’t want to forget because a diaper rash is just miserable! Hand sanitizer: All the Disney parks have Baby Centers where you can sit in the ac and feed your baby, change them, or just take a break and watch a movie or color. But if you’re on the other side of the parks and can’t get to the baby center before changing a diaper you’ll have to use the restrooms, and that’s where the hand sanitizer comes in! It also comes in handy if you’re waiting for a show and your little one gets hungry. Sunscreen: I never leave the house without this because my main priority is to keep my child’s skin as protected as possible. I do not want him to get burned, because if it’s miserable when it happens to me I can’t imagine how terrible it would be for him! Snacks: Depending on how old your little one is snacks are always a good thing to have! Our little one loves Puffs so we always bring a few cans as well as some teething wafers. Placemat: If your little one is eating solids you’ll want to put something on the table for them to eat off of! Bottle: I’m not going to lie, we actually left our little guy’s bottle in the resort room for the first two days! Poor kiddo. We breastfeed so he was luckily still getting liquids, but don’t forget the bottle! Medication: Okay, so technically this isn’t food but it’s the only category this fits under! We were the lucky parents of a child who was teething at Disney, so we kept tylenol with us at all times in case he needed it. You can also bring Motrin if your child is old enough. Extra Onesies: I think this one is something we all have in our diaper bags no matter the occasion, because you never know when an accident may happen! Ziploc bags are useful in this instance so that you can keep all the little pieces of the outfits together. And then, if they have an accident, you can stick the soiled clothes into the bag so the mess doesn’t get everywhere in the diaper bag. Burp Cloth(s): For those times where your little one is eating. You don’t want to ruin that super cute outfit they have on! Sunglasses, Pacifiers, & Hats: So, my kiddo doesn’t like any of these things (he’d much rather eat his sunglasses than wear them) but they’re all great things to have! Blanket: To be honest, unless we’re at the Magic Kingdom this is something we leave in the car. It’s just too hard to get to the car from DMK so we do take the blanket with us. In the evenings it can get cool so keeping your little one warm is a must if you want them to stay happy at night! This really depends on how old your little one is and what they’re into. For our little guy, his Mickey lovie is currently his most treasured toy and he loves to chew on it, rub it against his face, or just crinkle the ears. His oBall is another toy he is absolutely obsessed with, and provides a great distraction while waiting for parades. If your little ones are older bringing books to read, coloring books, stickers, and more would also be great to have while waiting in long lines or for the parades and fireworks shows! I really do try to keep the minimum amount of things I need in my bag at all times. Especially because I also have my camera bag that I carry around and I don’t want to be overloaded. And I honestly believe that kids really don’t need a ton of extra stuff to lug around. Just enough to keep them happy and preoccupied while waiting for things! If you’re looking to stock up on diapers, Sam’s Club is offering a $10 e-gift card (when you buy two Huggies items from now until June 30, 2016)! So now is the perfect time to stock up on Huggies Little Snugglers and the Huggies Natural Care wipes! Just snap a photo of your receipt and email or text it to Huggies by July 15, 2016 and they’ll send you instructions on how to get your e-gift card! What does your Disney diaper bag look like? How do you keep your little ones snug and dry at the parks?